When Alex Rodriguez released his handwritten public apology this week for all things PED-related, we didn’t really know what to think. After all, who are we? Just some members of the media, you know? Not public apology experts or anything like that. But then we realized there are public apology experts in the world, and that we could ask them what they thought about the apology. So we did! The good: [Rodriguez] "takes full responsibility," says "sorry," and expresses remorse. The language is straightforward and the sentences are simple. He writes with nouns without relying on adjectives to drive home his points. He acknowledges his lack of credibility, and, in a nice touch, declares that he doesn't want to further tarnish the pinstripes by apologizing on the field. But in large part, our expert panel found the language used in the apology not very straightforward. In fact, multiple people said the language was so emotionless and unclear that it made the apology appear basically meaningless. "It comes across as very impersonal, not heartfelt, very vague,” David Johnson, CEO of Strategic Vision, a public relations agency, agreed in a phone interview. "Why was it so vaguely written? Is there something else that could come out that could be vaguely damaging?" Then, of course, there was the unusual decision to issue a handwritten note. 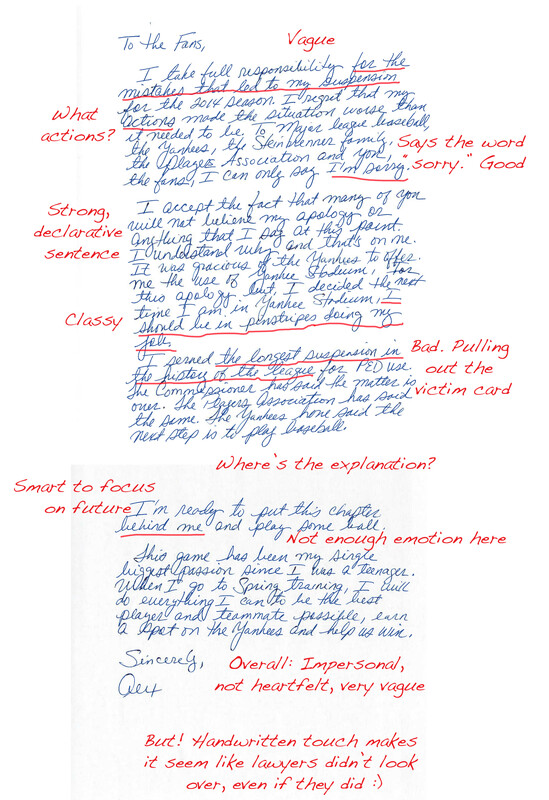 Almost all our experts agreed the choice was meant to personalize the apology and make it seem like the letter was written by Rodriguez himself, rather than his legal or public relations team, while still controlling the message. But most of the panel said it failed to come across as honest. "He was trying to show that it was personalized, but overall it fails to satisfy anything he needs to satisfy,” Johnson said. Arnold compared Rodriguez’s attempt at authenticity unfavorably to another recent public apology: that of Seton Hall basketball player Sterling Gibbs, who was suspended earlier this week for hitting Villanova’s Ryan Arcidiacono in the face during a blowout loss. Rodriguez's apology certainly wasn't as immediate as Gibbs' apology, and that led experts to question the reason for its timing, just a few months before the start of the MLB season and well over a year after he was suspended for the entirety of the 2014 season. “The delay is a big red flag: why say sorry now? Why the sudden and complete change of heart?” Rick wondered. "It comes across almost like he felt like he had to do it, rather than true contrition,” Johnson agreed. All in all, the experts generally agreed Rodriguez’s apology didn’t do enough to put the issue away in time for Spring Training.